Uppers made of chrome tanned cow leather, origin in Spain. Lining made of vegetable tanned calf leather, removable insole. Slip-proof rubber sole. Slippers made in Ukraine. Colour graphite. Carpet slippers made of suede leather which thanks to their rubber sole will tolerate a short junket outside, to take out the rubbish, for example. The leather insole is rubberised beneath the toes and the balls of the feet, and the section of the insole from the middle foot to the heel is equipped with an anatomically formed layer of cork-latex. It can be removed and replaced with an insert of your choosing. 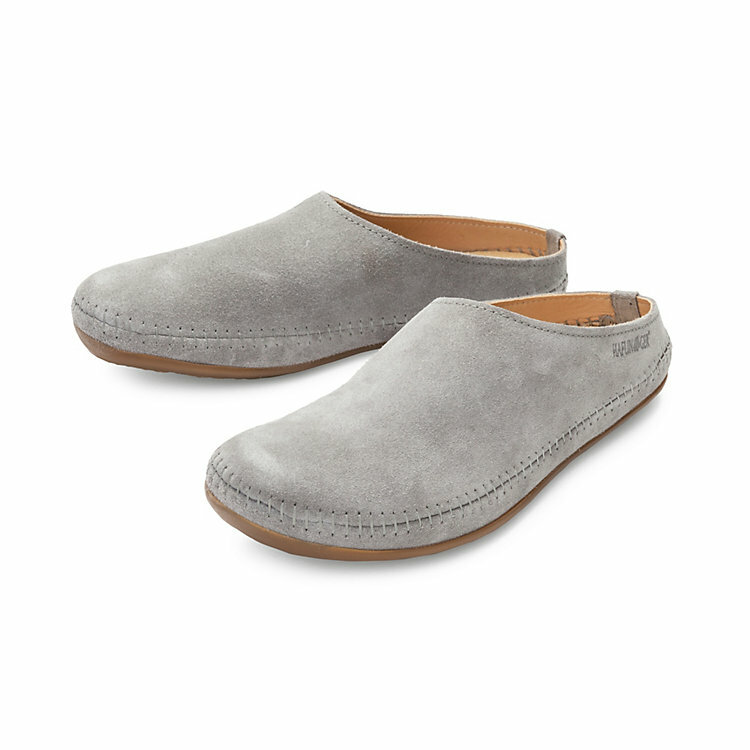 Slippers with Stature from Haflinger. Haflinger slippers owe their good reputation to a combination of functionality, well thought out design and excellent work by qualified craftsmen. Haflinger uses almost entirely natural materials including felted virgin wool, leather and cork-latex footbeds, all assembled with traditional shoemaker craftsmanship. The result is a range of slippers in which you can literally feel at home.